For the last ten years FPMT International Office has been working to build up an endowment fund large enough to support the long-term health of the Sera Je Food Fund, whereby the interest from the endowment would cover the annual costs associated with offering three nutritious meals daily for all the monks of Sera Je Monastery, for as long as the endowment remains. In January 2017 we raised the targeted amount needed for the endowment. This means that the Sera Je Food Fund is now self-sustainable and can be run from the interest of this endowment. This is an incredible achievement. Thank you for your part in actualizing this. Sera Je Monastery is now managing the endowment and the ongoing management of the food fund. Therefore the Sera Je Food Fund is now closed as an FPMT charitable project. 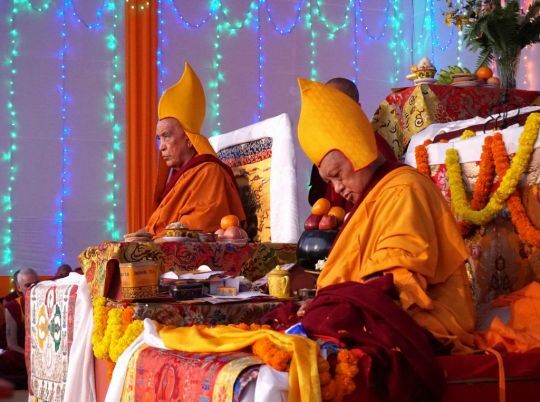 Supporting monks and nuns is one of the highest priorities for Lama Zopa Rinpoche and the FPMT organization, because the preservation of the Buddhadharma is dependent on the existence of Sangha. We invite you to join us in developing the Supporting Ordained Sangha Fund which is offering support to monasteries, nunneries, and individual monks and nuns for food, accommodation, health care and education. This fund is not limited to any one institution and able to benefit many nunneries, monasteries and Sangha in need. January 2019: please enjoy an extensive history of the Sera Je Food Fund from inception until the endowment handover to the monastery, “Sustaining the Pure Unbroken Lineage of Buddha’s Teachings in this World: The Legacy of the Sera Je Food Fund” published in Mandala magazine, available in PDF or eZine format. Please watch this video of Lama Zopa Rinpoche thanking those who have supported the Sera Je Food Fund over twenty-seven years. In this message, Rinpoche explains the vast benefits of offering food to Sangha. The Sera Je Food Fund provided three nutritious meals daily to the monks living at Sera Je Monastery in southern India for twenty-six years. This service provided one of the most fundamental needs for life – food – and allows the monks to focus on their studies without the burden of sourcing and preparing their own meals. 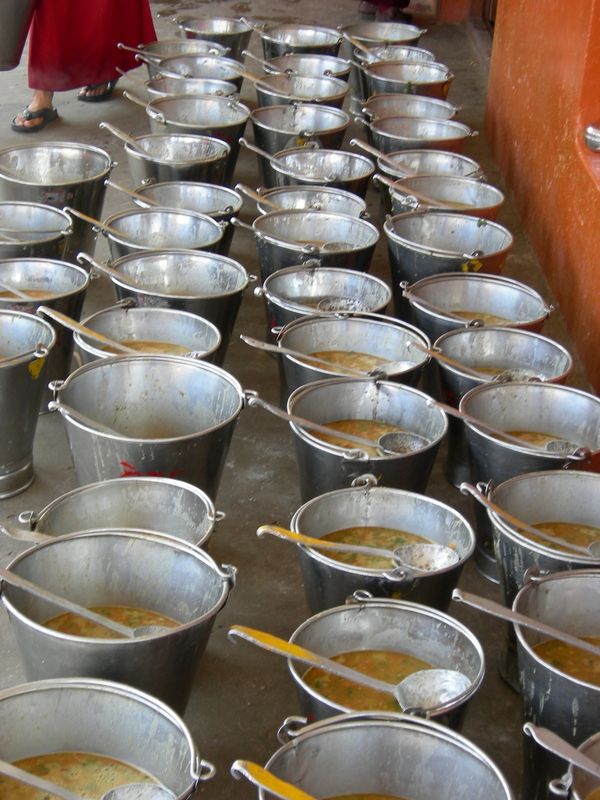 The Sera Je Food Fund has offered millions of meals since 1991. At the time of this fund becoming self-sufficient it was offering approximately 700,000 meals per year, 2,900 meals per day and the annual cost was US$200,000. A short film on the Sera Je Food Fund featuring Lama Zopa Rinpoche is available. In this video Rinpoche candidly speaks on the importance of supporting the food fund and the role it plays in spreading the Dharma in our world. Scenes from daily life at the monastery, including the logistics of preparing meals for all the resident monks at a time. More videos about the Sera Je Food Fund can be found here! What Does Offering Food Cost? Every day, three meals are prepared for all Sera Je monks. This is a typical day’s menu for the monks at Sera Je Monastery. Photo gallery of daily breakfast offered to the monks by the Sera Je Food Fund. Photo gallery of seven days of lunch offered to the monks by the Sera Je Food Fund. Photo gallery of seven days of dinner offered to all monks by the Sera Je Food Fund. See details of what it takes to offer food through the Sera Je Food Fund every month and how a community of monks help serve one another. Tenzin Ösel Hita with the monks at Sera Je Monastery. The Sera Je Food Fund began in 1991 when Tenzin Ösel Hita, the reincarnation of Lama Yeshe, entered Sera Je Monastery in southern India at age six. It is customary for a monk’s sponsor to make offerings to all Sangha on the day of officially entering the monastery and Lama Zopa Rinpoche wanted the offering to be of the greatest practical benefit to the monastery itself. After discussion with the abbot of Sera Je Monastery, it was determined that the most beneficial offering would be to create a food fund whereby all of the monks at Sera Je Monastery could be offered quality meals for free. Out of his incredible compassion, Lama Zopa Rinpoche was not simply offering lunch on the day of Lama Osel Rinpoche’s entrance to the monastery but, without precedent, taking on the responsibility of providing meals to every monk at Sera Je for the rest of their lives. More on the history of the Sera Je Food Fund…. Please read “Life in Sera Je,” by Geshe Thubten Sherab to learn more about everyday life at Sera Je Monastery. Taking responsibility for supporting these practitioners is extremely worthwhile because they are preserving and spreading the entire teaching of the Buddha. There are extensive prayers and dedications made by the monks at Sera Je for those who contribute to the fund. These dedications will continue to generate merit for those donating to the fund for as long as the monastery exists. Lunchtime at Sera Je Monastery. On behalf of Lama Zopa Rinpoche, we would like to offer our heartfelt gratitude to all of the kind benefactors who have been contributing to this project over the years and supporting Lama Zopa Rinpoche’s vision. Please rejoice in twenty-six years of offering food to the monks at Sera Je Monastery. We invite you to take a moment to rejoice in this incredible offering, the benefits of which will continue long into the future. Every person who has contributed to the Sera Je Food Fund — whether with donations, time, or prayers — all of this incredible merit of offering to the Sangha will continue to grow and benefit. Or simply send your check in US dollars payable to FPMT Inc. and write “Sera Je Food Fund” on the memo line. The Sera Je Food Fund is a project of FPMT Inc. and is administered by FPMT International Office located in Portland, Oregon, United States. All donations made to this fund are tax-deductible within the United States in accordance with IRS Code article 501(c)(3) to the extent allowed by law. For more information please contact: Charitable Projects Coordinator. No desire means no emotional pain of attachment, anger and jealousy. There is peace, openness and space for genuine love and compassion to arise.